This may not impress you if you live near the ocean. But this Lake Michigan, and one thing I’ve learned in my eight years of living by Lake Michigan, is that Lake Michigan doesn’t do this. 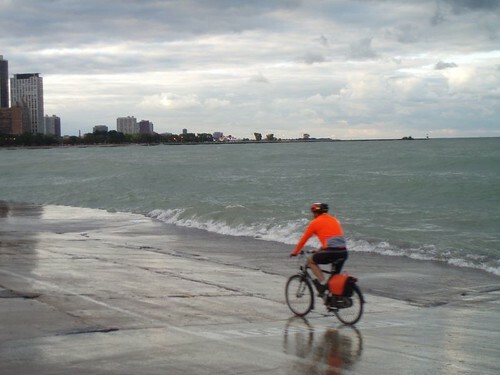 Lake Michigan does not rise up and send waves crashing over the sea wall and onto the bike path. 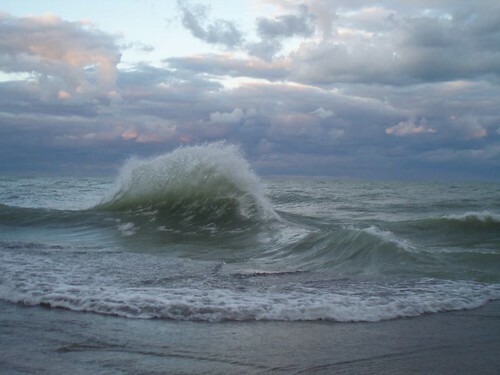 Lake Michigan does not churn up waves that rise up higher than your head. Lake Michigan is not violent or dangerous! Living by the placid shores of Lake Michigan, it’s easy to forget that it is a lake in name only; in actuality it’s a vast inland sea, large enough to affect local weather patterns, and large enough to do whatever the heck it feels like. 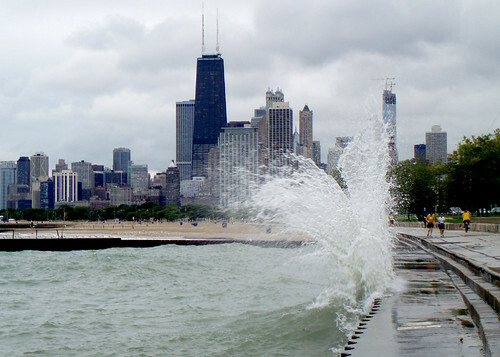 Newcomers like me have only seen it at the low water levels of recent years, but in the early 1980s waves were actually crossing Lakeshore Drive and crashing against apartment buildings. This entry was posted in biking, Lake Shore Drive, Life in Chicago. Bookmark the permalink. I got a chuckle from this. All through the mid seventies the lake level was going up and houses were being washed into it along the Indiana shoreline, and there were worries about the high-rises along Sheridan in Edgewater too. But a storm seiche can be pretty deadly too, but for people not buildings. There is a great Chicago Stories program about the big one we had in the fifties.